CALGARY — Right wing Jarome Iginla announced his retirement Monday, July 30 at Scotiabank Saddledome in Calgary, ending his career in the city where he played 16 seasons – including nine as captain. Overall, Iginla’s 20-season NHL career spanned from 1996-97 to 2016-17 and saw the power forward appear in 1,554 games with the Calgary Flames, Pittsburgh Penguins, Boston Bruins, Colorado Avalanche and Los Angeles Kings. A consistent offensive threat, Iginla finished with an even 1,300 career points (625-675—1,300), reaching the milestone with an assist in his final NHL game on April 9, 2017 (w/ LAK). One of the top scorers of his time, Iginla is one of just 20 members of the NHL’s 600-goal club. His 625 career goals are tied for 15th in League history with Hockey Hall of Famer Joe Sakic. 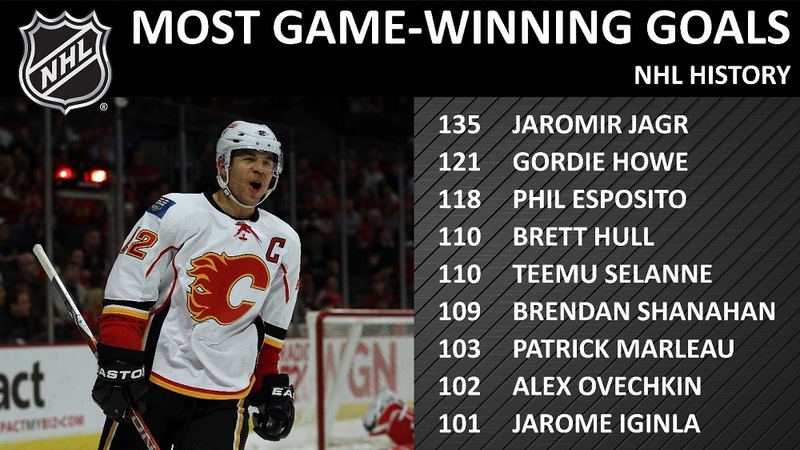 Every player ahead of Iginla on the list – other than Jaromir Jagr, who is not yet eligible for induction – has been inducted into the Hockey Hall of Fame. * Iginla also is among a group of just eight skaters to reach the 30-goal mark in 11 or more consecutive seasons, doing so from 2000-01 to 2011-12 (all w/ CGY). He averaged 39 goals per season across the 11 campaigns. Iginla joined the Flames in a blockbuster trade that involved another franchise legend. The Dallas Stars, who drafted Iginla 11th overall in 1995, traded the young forward before his first NHL appearance – along with forward Corey Millen – for two-time 50-goal scorer and Stanley Cup champion Joe Nieuwendyk. 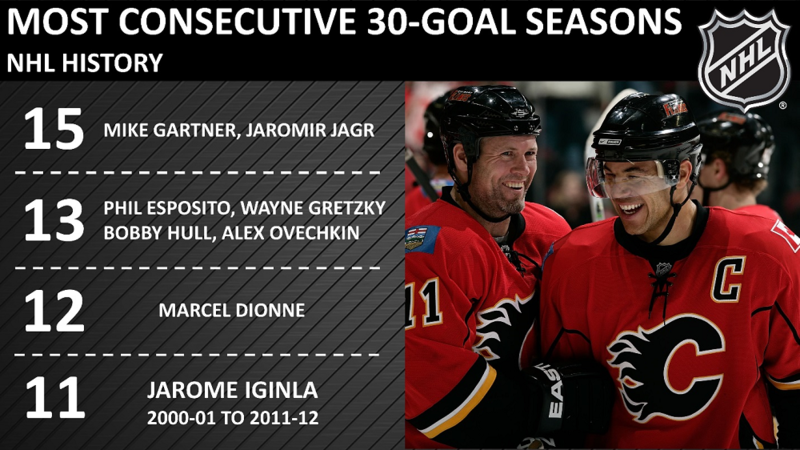 Iginla and Nieuwendyk remain the only players in franchise history with multiple 50-goal seasons. 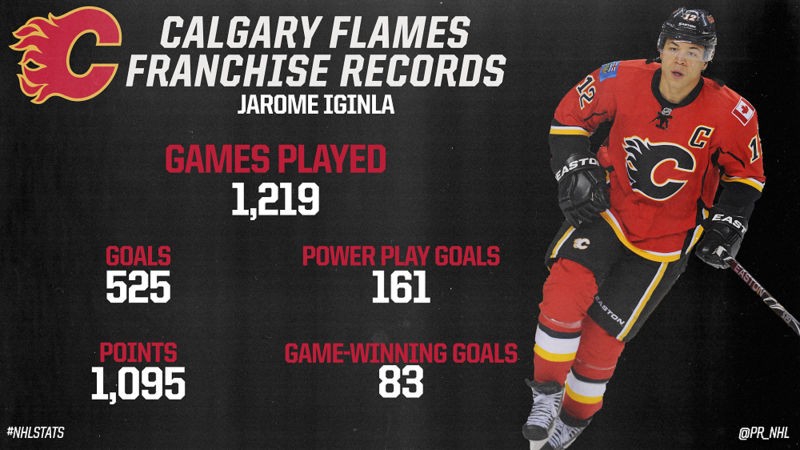 * Iginla led the Flames in goals 11 times during his career – more than anyone else in franchise history. Only three other players have led one franchise in goals on more occasions: Gordie Howe (15 seasons with DET), Alex Ovechkin (13 seasons with WSH) and Bobby Hull (12 seasons with CHI). * Iginla also topped Calgary in points an NHL-record 11 consecutive seasons from 2000-01 to 2011-12. Only eight other players have held that distinction as many times, regardless of consecutive seasons: Gordie Howe (17 seasons with DET), Joe Sakic (12 seasons with COL/QUE), Mats Sundin (12 seasons with TOR), Steve Yzerman (11 seasons with DET), Mario Lemieux (11 seasons with PIT), Alex Ovechkin (11 seasons with WSH), Gilbert Perreault (11 seasons with BUF) and Mike Modano (11 seasons with MNS/DAL). 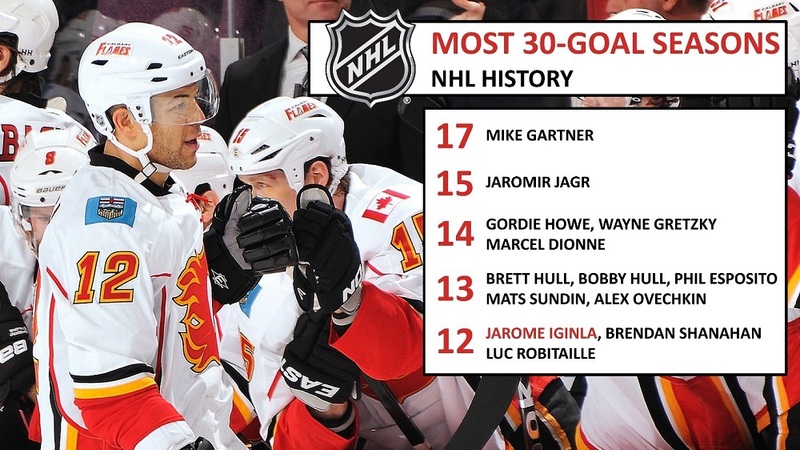 * Iginla remains the only player to score 500 goals in a Flames uniform, with Theo Fleury(364) the next-closest on the franchise’s all-time list. Longtime linemate Craig Conroy leads the way with 85 assists on Iginla goals during his tenure in Calgary, followed by Alex Tanguay(64), Daymond Langkow (51), Dion Phaneuf (38) and Olli Jokinen (35). * In Iginla’s franchise-record 1,219 regular-season games, two players appeared alongside him in more than 500 contests: Robyn Regehr (802 GP) and Miikka Kiprusoff (557 GP). * In 2003-04, Iginla led the Flames within one victory of the Stanley Cup before a one-goal defeat at the hands of the Tampa Bay Lightning in Game 7 of the Final. Iginla topped all skaters in the 2004 Stanley Cup Playoffs with 13 goals and led Calgary with 13-9—22 in 26 games during the memorable postseason run. 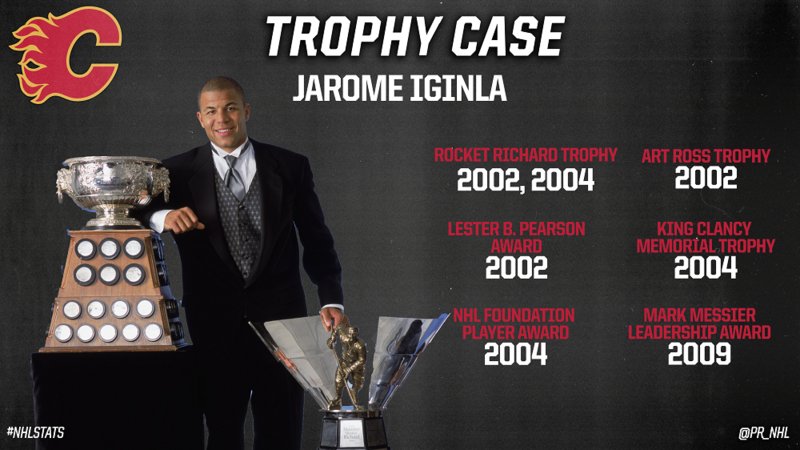 * Iginla twice captured the Maurice “Rocket” Richard Trophy as the NHL’s leading goal-scorer (2001-02 and 2003-04; three-way tie with Rick Nash and Ilya Kovalchuk). Alex Ovechkin(7), Pavel Bure (2), Sidney Crosby (2) and Steven Stamkos (2) are the only other players who have won the trophy multiple times since its inception in 1998-99. * In addition to his League-leading 52 goals, Iginla’s breakout 2001-02 campaign saw him capture the Art Ross Trophy as the NHL’s top point-producer (52-44—96 in 82 GP) and the Lester B. Pearson Award (since renamed the Ted Lindsay Award), which is presented annually to the League’s most outstanding player as voted by fellow members of the NHLPA. No other player in Flames history has captured the Maurice “Rocket” Richard Trophy, Art Ross Trophy or Ted Lindsay Award. * Known throughout hockey for his trademark smile, dedication to the community and fan-favorite status, Iginla was awarded the King Clancy Memorial Trophy and NHL Foundation Player Award in 2003-04 as well as the Mark Messier NHL Leadership Award in 2008-09 – all tributes to the character and compassion he delivered on and off the ice throughout his impactful 20-season career.